1429 Uncharted Seas slot is a truly unique game at PlayCasinoGames that’ll take you on an amazing sea adventure. The slot game will begin inside the deck of a ship; you will see a shot of a desk with what looks to be, a map or a scroll of some sorts. 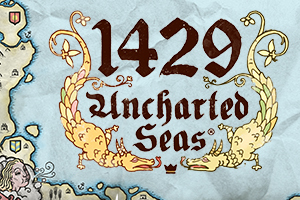 The graphics are truly astonishing in the opening sequence, as the camera moves towards the treasure map; it will soon become apparent that this is the 1429 Uncharted Seas slot game. It is fitting that the slot game should be played over a treasure map as that is essentially what you are doing – looking for treasure. On the reels or map, if you prefer, many symbols are reminiscent of an ancient treasure map with the symbols being portrayed in drawings. The drawings are very detailed though, with things such as mermaids, various sea creatures, different signs, pirate ships and more. The various symbols all contribute to wins across the 25 pay lines. You won’t need to be a pirate to take part in 1429 Uncharted Seas slot game, with the betting options being so easy to use and so diverse, you can be anything you want. The available bets in the game range from £0.01 to £100 per spin, so you can be as audacious or as brave as you like when you spin the reel, er, I mean map. The wild symbol is usually the most influential symbol in a slot game; it is common for it to hold a sense of importance. And in the 1429 Uncharted Seas slot game, it seems to hold an even more significance. With the ability to substitute for all symbols in the game, except the, scatter, the standard wild symbol – covered by a large ship – will appear on all reels. Except on reels 2, 3 and 4, it will also become stacked upon an entire reel as well, just to increase the winnings even further! The slot is based on times way into the past, when you were on a ship you didn’t depend on GPS’s or SatNav’s, a compass was one of the most important items a captain could have. In the slot game, it is just as important now as it was back then. The compass in the game acts as the scatter symbol and is the catalyst for players being rewarded with a number of free spins. The amount of compasses you land will determine the amount of spins you can get. Players can win 20, 30 or 50 free spins when 3, 4 or 5 compasses land respectively. Yes, players may win themselves up to 50 free spins on the 1429 Uncharted Seas slot; imagine the treasure that you could find when you have the reels spinning 50 times consecutively without paying a penny! Why not check out Turning Totems slot or The Rift slot? They are also brought to you by Thunderkick and available at PlayCasinoGames!